The Model ON-401-PP is a PVC Insulated and Jacketed Sensor for Use in Short-Term Water or Sub-Soil Readings. This is the Most Rugged Waterproof Construction. 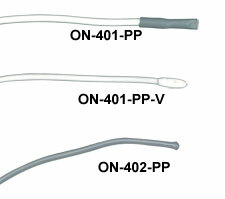 The Model ON-401-PP-V is a soft Vinyl Tipped version of the ON-401-PP Sensor. The Model ON-402-PP Sensor is a Miniature Version of the ON-401-PP Sensor with a 1/8" Diameter Tip.